Magner Model 35S — C&A Associates, Inc. 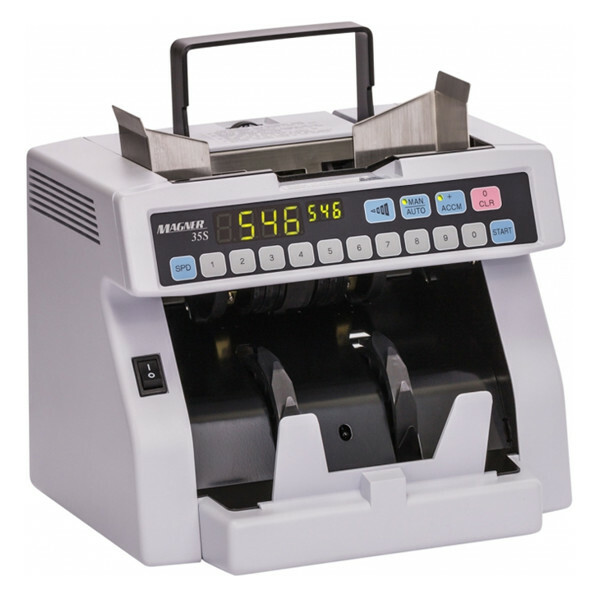 The Model 35S is the basic workhorse of the MAGNER® – family of friction currency counters. It is the largest selling desktop counter in the world and has earned a solid reputation as being highly dependable, with and average mean time of two years between failures. The Model 35S Currency Counter was expressly designed for outstanding performance in basic counting applications and to be ruggedly dependable even in moderate to heavy use customer environments, especially those that demand consistent operation when processing notes in all conditions. It is extremely simple to operate and offers standard features including selectable speeds, automatic start, variable batching, and accumulation mode to ensure greater productivity and maximum flexibility in currency processing applications. Copyright © C&A Associates, Inc. — All Rights Reserved.